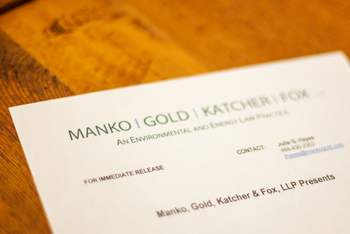 Philadelphia, PA (April 5, 2011) – At the Brownfields 2011 Conference that took place in Philadelphia on April 4 and 5, Manko, Gold, Katcher & Fox, LLP, (MGKF) the boutique law firm with a concentration on environment, energy and land-use, was involved in many aspects of the conference. On Tuesday, April 5 from 9:30 to 11 a.m. they sponsored the Pennsylvania Brownfields Stakeholders event at the Marriott Hotel where founding partner Joseph M. Manko served as the facilitator of a panel discussion with three very distinguished panelists: Pennsylvania Department of Environmental Protection Acting Secretary Michael Krancer, Pennsylvania Department of Community and Economic Development Acting Secretary Alan Walker and Bart Blatstein, Principal of Tower Investments, Inc., one of the leading developers of retail, entertainment and commercial properties in the Philadelphia area. MGKF, always on the forefront of brownfields work in the region, hosted the program that focused on the State of Pennsylvania Brownfields markets and future trends."